Add leftover Christmas turkey and warm this rice dish in the microwave for a couple of minutes, until poping hot, for a great St. Stephen's Day lunch. Pour the 200ml of olive oil into a small saucepan along with the cider vinegar and honey and warm gently for 5 minutes. Add half the cranberries and the salt and pepper and set aside to cool. Peel the parsnips and cut into 2cm slices on the diagonal. Toss in 2 tablespoons of olive oil, spread on a baking sheet and roast in the oven for 20 minutes. Meanwhile, cook the basmati and wild rice mix according to the packet instructions. In a dry frying pan set over a low heat, toast the pecans for 5 minutes. Tip out onto a plate to cool. Chop the unpeeled apples into 2cm cubes, then toss in the lime juice. Blend the cooled salad dressing with a stick blender. The thickened dressing will keep for up to four days in the fridge. Crisp the sage leaves by tossing them in 1 tablespoon of olive oil in a frying pan for 2 minutes over a high heat. Be careful not to let them burn. Drain the leaves by placing on kitchen paper once crisp. 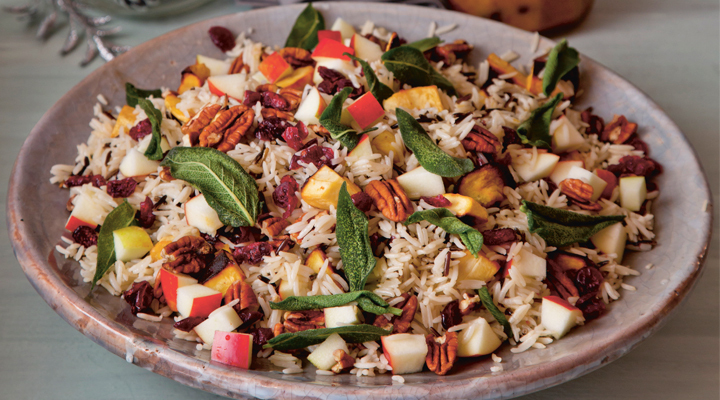 To serve, mix the rice, parsnips, pecans, apples and the remaining cranberries in a large bowl or serving platter. Dress with the cranberry dressing and sprinkle over the crisp sage leaves.